The development of subproject IO3 was starting on the following reflection: Within higher education, students’ voices are usually not taken into consideration when deciding what we teach – e.g. courses and curricula, and how we teach – e.g. methods. There are some arguments to include students as partners in the pedagogical process. This would go further than only consulting students. It would mean that they become full participants in the teaching methods, the courses and even one step further, the whole curricula. It would also mean that students will experience the freedom to become critical thinkers and take more responsibility for their own learning. Student learning is deepest when they become their own teacher. However, enhancing student participation doesn’t mean we can discard teachers’ expertise, it is about cooperation and partnership. 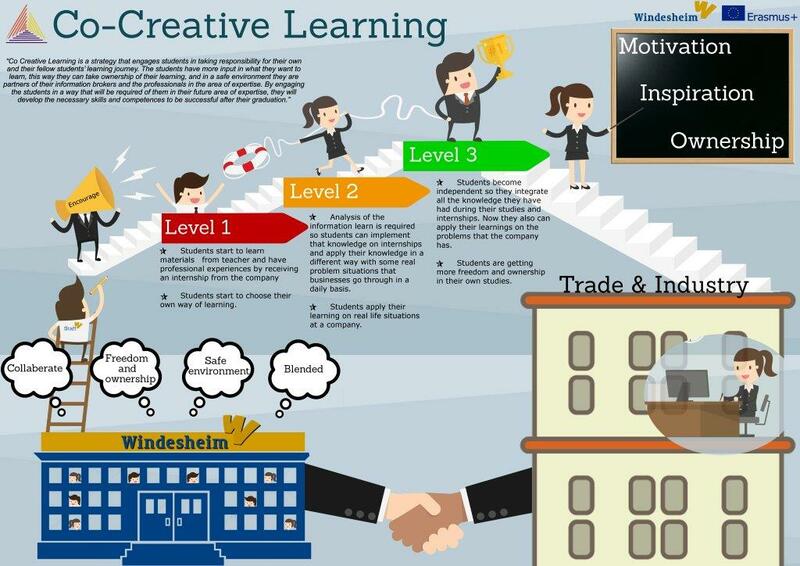 During project IMPROPAL, the Co-Creative Learning (CCL) teams of Windesheim UAS, The Netherlands were developing a structure for how a pedagogical approach based on a high level of student participation could be conceived. The approach was performed in 2 different courses within the study programme Industrial Engineering and Management. CCL was also implemented within Logistics Engineering and Architecture Studies. In the first part of the project, the co-creative learning approach was implemented in a course in Management Skills, by a group consisting of expert students – who previously had the course in a traditional way and would assume a more leading role, new students, and 2 lecturers – one topic expert and one research expert. During the course, that also included internships for 2 days a week in companies, the group was creating the actual study programme and compiling research and proposals regarding the co-creative process, for the next group. In the second part of the subproject, the co-creative approach was developed for the course Behaviour in Organisations. While in the first part of the project, the students prepared a programme for the next semester, the current group developed a programme while they are following the same topic. Important part in this set-up is the involvement of part-time students (and their related companies). Another goal of Co-Creative Learning was to gather experience and practical knowledge about assessment in a co-creative teaching environment. In a more traditional approach to examination, the lecturer creates a test and students have to write the test, such as theory or case based tests and/or presentation and defence. These types of tests center the desired learning outcomes and the preferences of the lecturer. The tests are not (or only by coincidence) based on the different learning styles of the students. In ‘student based examination’, the CCL approach was promoting tests by which students can show the desired learning outcome for the subject or project, while taking into account his preferred learning style. E.g. a student might have a more practical approach to theory, in that case they might want to transfer their knowledge to practice, thus the examination method can be: to provide a solution to a problem in industry in which they demonstrate an (in-depth) knowledge of the theory. Co-creation of an international learning experience – ‘Education on the move’ – A collaborative journey for students & lecturers. The course module ‘Field Trip’ was developed within the work and study field of Architecture by 3rd- & 4th-year students from Windesheim University and from international partner universities, as a collaborative journey for students & lecturers. The students were challenged to increase responsibility for their own learning through 3 different shared stages: 1) preparation – The students engaged in formulating learning goals, assignments and outcomes of the Field trip. They were responsible for identifying the destination, determining the content of the itinerary and organizing the journey and stay. 2) journey – All the prepared plans, ideas and assignments were carried out by the students during the trip. 3) evaluation and dissemination – Assignments of the Field trip, and the module in total, were assessed and evaluated by students and lecturers. The outcome of the evaluation was creating an input for the next Field trip. Students shared their gained experience and knowledge with the following group. The pedagogical approach of Co-creative learning is a tool for increasing students’ own responsibility for their learning, within different levels of education and internship guidance, courses or programmes. Illustrative steps of the development, results and dissemination are available on www.impropal.eu , including good practice examples from the followers of the approach Xenter Botkyrka, Sweden and TUCN, Romania.